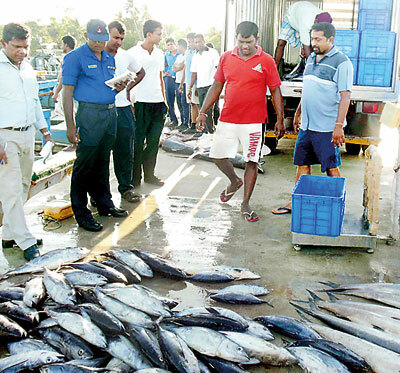 The catch confiscated from three Indian multi-day fishing trawlers arrested by the Sri Lanka Navy while the trawlers were poaching in Lankan waters were ordered by Puttalam District Judge and Magistrate Dammika Illangasinghe to be sold.�The Fisheries Corporation outlet at Kalpitiya was ordered to sell the 1,300 kilos of fish seized. The 16 South Indian fishermen, who were taken into custody by Navy personnel on Friday were ordered to be remanded till March 18.�The fishermen are residents of Tuticorin, Tamil Nadu. One of the Indian fishermen, Manigaraj Suwarimuttu (65) said fishermen of both countries cross each others’ borders frequently. Abbas Marikkar, (42) another Indian fisherman said that there is a severe shortage of fish in the seas off the Indian coast. 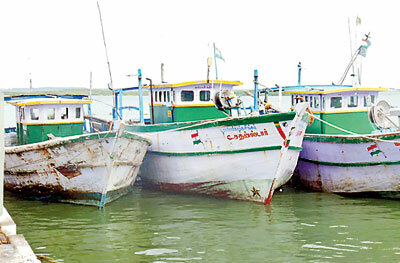 However, the Kalpitiya fishing trawlers’ association’s president Anton Kusum Rex said that due to the increase in Indian fishermen poaching in Lankan waters, many trawlers were not able to get a good catch and added that Indian fishing trawlers have destroyed fishing nets of local fishermen.